Penn State got so close. Forty-eight hours to be exact -- 48 hours until the Nittany Lions ran out on to the field with the right to have 85 scholarship players for the third time this decade. 48 hours until a new era could really begin, a new offense installed with new assistants calling State College home. This is a program with a new lease on life and a stable of players excited to be a part of their own little piece of history. Just another football program. But buried in a news release about meaningless gameday themes and events, Penn State thought it could quietly announced on Thursday that it would be "commemorating" the 50th anniversary of Joe Paterno's first game as head coach. 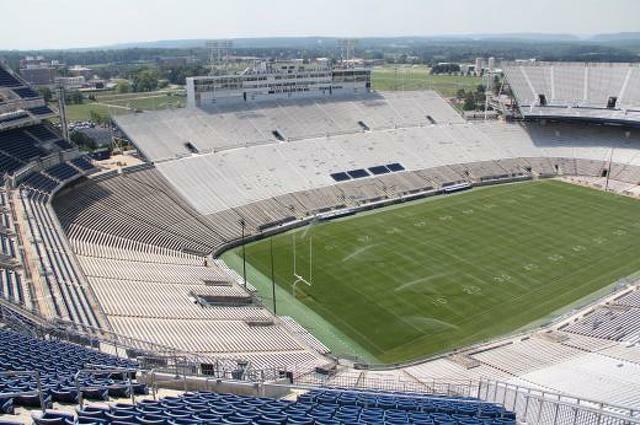 The event itself will take place on Sept. 17, sometime before, during or after Penn State's game against Temple. What exactly commemorating means is also a detail yet to be disclosed. The headlines have already been written, old scars have been knifed open. The damage has been done. Days before Penn State was set to step into something new and exciting, somewhere in the long halls of Old Main that door was slammed shut. And here everyone now stands, 48 hours from an otherwise promising day for a program full of that same kind of promise, talking about "it" all over again. In truth the Jerry Sandusky scandal will never leave Penn State and it never should. It's not as though you can simply let the passage of time erase horrible things. But if nothing else Penn State was seemingly rid of so much that had eroded at the innermost core of the very structure of the university. Having differing opinions about Paterno's role in the scandal is an anticipated and acceptable byproduct of a case full of emotions, half-truths and missing information, but it doesn't have to be what defines the university's chief discourse. It doesn't have to be what dominates the conversation as Penn State faces Pitt and Temple in back-to-back weeks. All of this news coming after athletic director Sandy Barbour made a point to address unaffiliated Pitt t-shirts announcing that "Joe Knew." In short, for the first time in years Penn State had the chance to control the message heading into its season opener and make it a positive one. And instead of focusing on the new and the exciting, Penn State opted to try and sneak past a headline that is already trending on Twitter and leading news broadcasts. With the chance to say anything it wanted, Penn State said it couldn't let go. Who is to blame is probably a multi-faceted answer. It certainly isn't James Franklin who not 24 hours prior to the announcement talked to the media about not looking into the past and focusing on the future and the present. If anyone wants to get out from underneath the shadow of the entire scandal, it's the man tasked with moving away from it. Really though this comes back to the loud and the restless. It's how Donald Trump has made it this far -- it's an angry fringe holding common sense hostage for the sake of some slice of an unimportant pie. It's otherwise intelligent people caving to the demands of the most passionate because peace is better than war even at the cost of logic. Penn State almost undoubtedly was never going to honor Paterno on its own, let alone randomly in the dead of a season years after the fact without some motivation. That niche has never faltered and to their credit they're finally getting what they wanted. They've burned down the house in the process, but they're finally getting it. Which leaves Penn State in a lose/lose situation. The next two weeks will have more headlines about Paterno than you can count. There will be debates online and off. There will be all the angry arguments that have come and gone time and time again for the past several years. All for the sake of making a subset happy. So Penn State can go ahead with things, take the PR hit, take the self-punch and finally (maybe) silence a group of fans that have short-circuited an otherwise well-functioning town for the sake of a man whose legacy is dubious at best. Especially true if some statue gets carted out on to the field, however unlikely. Or Penn State can back off its plans. Releasing limited details means that you can't see the retreat as it happens, and it means that whatever happens will have always been the plan. But too small of an act and it will look like Penn State faltered under the "media pressure" and in turn the unhappy will remain that way. Ultimately the mess will pass because the news cycle has too much to do to fixate on this, but the damage is done. Penn State is once again the place where people just don't get it. Doesn't matter if that's true -- because it probably isn't -- it just matters what everyone thinks. And that's really the lesson here, that maybe sometimes when you want something you still shouldn't get it. Because honestly there hasn't been a good moment to honor Joe Paterno, and there probably never will be. For the longest time it looked like Penn State knew that, and then on Thursday, the hostage takers finally won. State College Police are seeking help identifying a suspect in a retail theft. Police say a man entered Nature's Pantry, 2331 Commercial Boulevard, at 2:18 p.m. on Aug. 19 and took merchandise without paying. The suspect is described as a white male with short dark brown or black hair and a muscular build. He was wearing a red Reebok shirt, blue shorts and glasses.